Maine to Morocco: Appalachian Trail to leap abroad? TOWNSHIP 5, RANGE 8 — First there was the Appalachian Trail, which winds 2,175 miles along the mountainous spine of the eastern United States. Then came the International Appalachian Trail, stretching the AT’s northern end in Maine to the edge of Canada’s Maritime Provinces, where Vikings long ago landed. Now they’re extending the walk: across the Atlantic to western Europe, where the mountain chain’s other half loops south to Morocco. 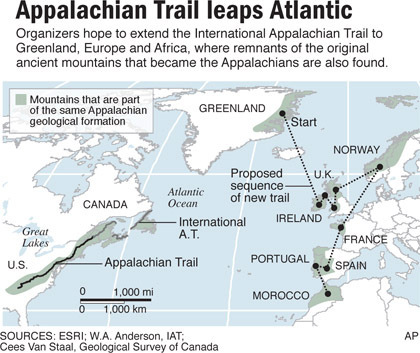 Like restless hikers who just can’t sit still, visionaries whose years of work led to the IAT’s extension are thinking more internationally as they peer over time’s horizon toward the very creation of the Appalachians and plot their course to the ancient mountain chain’s geological end. The Appalachian Trail’s visual delights are almost legendary with trails winding beneath thick tree canopies to breathtaking mountain vistas. 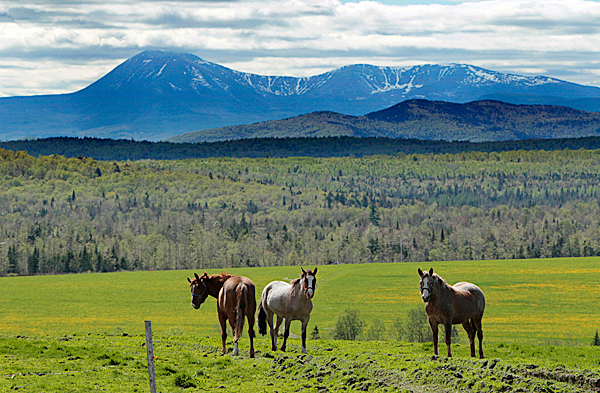 But the beauty of the AT, hiked at least in part by 4 million people a year, doesn’t end at Maine’s Katahdin. For many, hiking the trail is a reconnection to nature, even a spiritual experi-ence. IAT hikers are rewarded with views that include a blue-green expanse of rolling mountains in New Brunswick, Cape Gaspe jutting like a giant arm into the Atlantic, and perhaps a herd of caribou along the trail in Newfoundland. And the beauty will continue after the trail cuts its horseshoe-shaped path overseas. The Appalachian Trail, part of the National Park Service, grew from an idea in the early 1920s to completion in 1937. From Springer Mountain, Ga., about 60 miles north of Atlanta, it traverses 14 states before it ends with a cairn and rough wooden marker on the top of Maine’s mile-high Mount Katahdin in Baxter State Park. 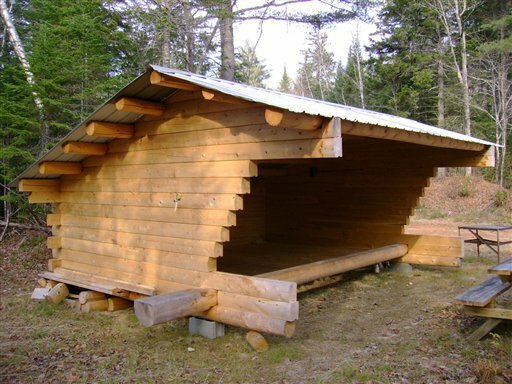 Along the way are more than 250 primitive shelters and campsites. 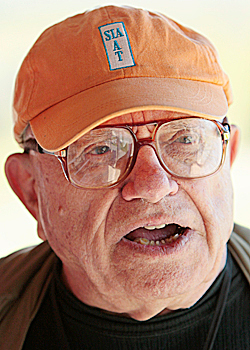 In 1994, extending the AT into eastern Canada was proposed by Joseph Brennan, a former congressman then running for a third term as governor. The idea took hold, and the route now extends 130 miles across Maine and 212 miles across neighboring New Brunswick, where it crosses the province’s highest point, Mount Car-leton. The 410-mile Quebec leg leads to the Gaspe Peninsula. From there, hikers can take a train ride south so they can access the mammoth bridge to Prince Edward Island and its 91 miles of trails. Once back on the Canadian mainland, the trail leads to a ferry to Nova Scotia, where hikers cover 287 miles before ending at another ferry landing at the east end of the province for a ride to Newfoundland. The last leg of the journey is also the longest: 741 miles straight up the mountainous western edge of Newfoundland to Crow Head. The 1,862-mile IAT ends near L’Anse aux Meadows, where Norsemen landed and built a village a millennium ago. “It’s the only place where you can hike on a long-distance trail and see whales and icebergs,” Anderson said. It’s also where the crossover would begin to the European leg of the trail. Walter Anderson, a former Maine state geologist, explained why. A few hundred million years ago, after the continental plates of Europe and North America collided, they broke up and drifted toward their present locations, Anderson said. The remnants of that colossal crash formed mountains that now rim the North Atlantic. On the west they’re called the Appalachians. On the east, they’re known by a variety of names — from the Western Alps in Norway to the Caledonides on the British Isles and Atlas Mountains in Morocco, where they end. As it’s now shaping up, the IAT will brush the east coast of Greenland before picking up in Ireland and Northern Ireland, Wales and Scotland. It will resume on the mainland in Norway and proceed south through France, Portugal, nip western Spain and end in Morocco. Trails already exist along much of the conceptual route, planners point out, so participating countries in many cases can mark certain trail segments with the IAT sign to make it part of the network. Where the trail meets the seas or overland gaps, hikers will have to make their own ferry or train arrangements. Richard Anderson said he and other IAT leaders already have talked up the idea with European counterparts, and initial reactions are positive. In Ireland, the IAT extension “has and is being taken seriously” since it was first presented last year, said Cormac Macdonnell of the Irish Sports Council’s National Trails Office. Initial plans would link existing pieces of “multiday walks” into the IAT extension, which could include a stretch along some of Europe’s highest sea cliffs in County Donegal, Macdonnell said in an e-mail. In Scotland, officials are also looking at having existing trails join the IAT, said Hugh Barron of the British Geological Survey in Edinburgh. But Barron noted that progress has been slowed down by the poor economy. Discussions have been ongoing with Spanish and French officials; talks are planned with the Portuguese and contacts have been made with the Norwegians. Greenland says the trail, still to be plotted out on its east side, is a go. Extending the North American trails to Europe is a big idea, but so was the IAT when it first germinated. And while the Appalachian Trail’s path is pretty well-established, its IAT extension in eastern Canada is constantly being redefined as new rights-of-way are acquired, woods trails are blazed and accommodations along the way are improved. Organizers are reluctant to put a deadline on their work, saying the trail is ever-evolving. By earlier this year, fewer than 100 hikers had walked the IAT from Maine’s Mount Katahdin to Cape Gaspe. A little more than a dozen had completed the walk from Katahdin to its present end in Newfoundland, not including the Prince Edward Island leg because it was not yet added. 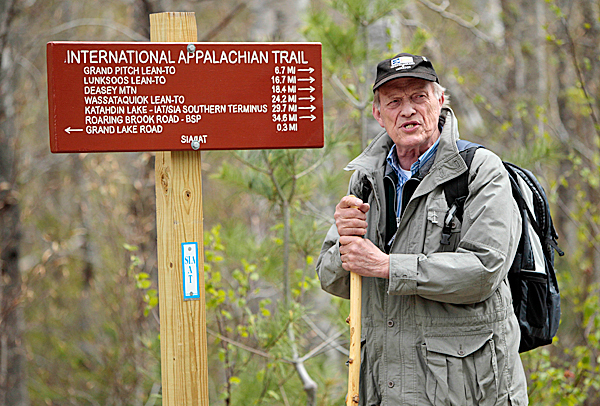 One of those to complete the IAT is M.J. Eberhart — also known by his trail name, Nimblewill Nomad — a 71-year-old long-distance hiker who has covered thousands of miles since the early 1980s. “The fact that the Appalachians exist both here and in Europe — the extension would certainly seem logical,” Eberhart wrote in an e-mail.